Envirotech manufacturer of Ceiling Acoustic Tiles, Acoustical Ceiling Panels,Sound absorbing Ceiling Panels with Excellent Sound Attenuation Provide NRC is 0.95. fabric laminated in various colors, shape and size. Envirotech Systems Manufacture Acoustic Ceiling tiles are fabric laminated & without fabric laminated multi color acoustic tiles. Echo Stop acoustic Ceiling Tiles offer excellent sound control performance by providing high sound absorption. These tiles are Micro-perforated which provides high sound absorption properties. The lightweight base makes installation easy. Envirotech acoustic tiles and Panels are inherently resistant to the growth of mould and mildew, fire resistance, recommended for high-humidity areas. 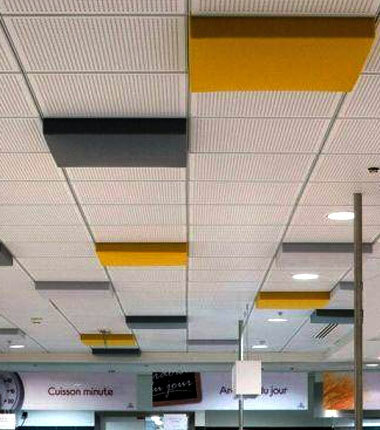 Acoustic Ceiling Tiles (25 mm) NRC is 0.95, which can effectively control and adjust the indoor reverberation time, reduce noise, the improve sound quality. Envirotech Acoustic Ceiling Tiles and Panels are Fungi and stains-resistance, recyclable, no radiation, does not contain any harmful substances. A new type of green building material without pollution to the surroundings. Envirotech acoustic ceiling tiles is installed as a lay-in tile in Grid T 24 /T15 / Silhouette T framework for suspended modular ceilings. Tiles can be easily dismantled for services work & reinstall. Envirotech acoustical ceiling tiles having high NRC value , widely used in Auditorium, Multiplexes, Home Theatre , Lecture Hall, Library, Gymnasium, Hospital, School, Shopping centre , Office building, , IT Sector, Airports, Recording Studio, Conference Hall, Lecturer Hall, , BPO’s, Offices etc. Envirotech wall panels having 3M self adhesive tape to fix on wall , the site installation is very easy also Tiles can be easily dismantled for services work & reinstall. Envirotech ceiling tiles having high NRC value , widely used in Auditorium, Multiplexes, Home Theatre , Lecture Hall, Library, Gymnasium, Hospital, School, Shopping centre , Office building, , IT Sector, Airports, Recording Studio, Conference Hall, Lecturer Hall, , BPO’s, Offices etc.